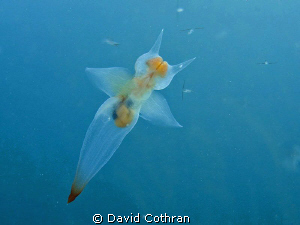 The pteropod Limacina helicina, a tiny sea animal that is usually under 1 cm in length, swims through the open ocean. They are a food source for birds, whales, fish, and other sea animals only slightly larger than themselves. They feed on plankton and float in large colonies, flapping their wing-like lobes. They have fragile, almost transparent shells that are present during the entire life cycle of many sea butterfly species. It is these shells which are the object of interest today. 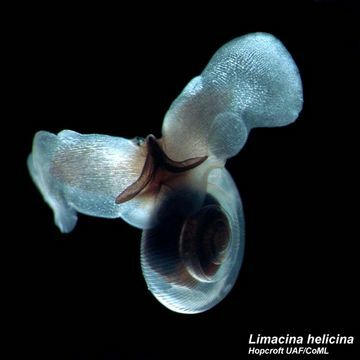 Clione limacina: Sea butterflies are the primary food source for the sea angel (Gymnosomata), a shell-less sea slug. According to the British Antarctic Survey (BAS), while carrying out research in the Southern Ocean together with other institutions, discovered severe dissolution of the shells of living sea butterflies, i.e. the shells are being dissolved by the raised acidity of oceans due to increased levels of atmospheric CO2 being absorbed by oceanic systems . Why is this important? But there are enough indifferent climate observers who aren’t really interested enough in a specific ecosystem, even if it might impact the amount of fresh seafood on the dinner plate, to make the sea butterfly’s plight a point of concern, much less action. So, aside from the biological relevance of the sea butterfly, their shells form an important component in the global carbonate cycle, part of which is the deep-sea calcium carbonate sediment formed by the remains of creatures like the sea butterfly. This sedimentary sink of CaCO3, which gathers like deep-sea snow in the form of discarded shells from the sea butterfly and many other animals, forms a buffering process between ocean chemistry and atmospheric CO2 by neutralizing the acidic influence of the carbon dioxide. Prior to the evolution of creatures with calcium carbonate shells in the ocean, the global atmosphere is thought to have been far more volatile – these shells helped mitigate the carbon cycle at shallower ocean levels and lead to an extended period of the more stable atmosphere which we humans need to thrive. 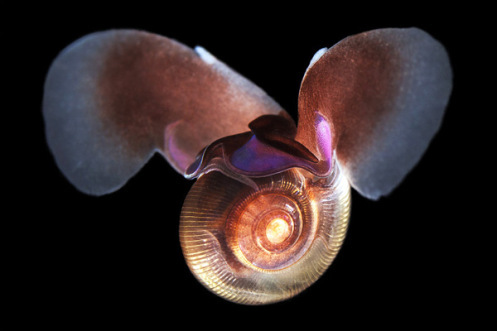 The tiny sea butterfly is thought to comprise up to 12% of the global ‘carbonate flux’. For their miniscule size, they are heavy hitters in the atmospheric game. Their shells are the thinnest and most fragile. They are, not to belabor an overused metaphor, the little canaries in our atmospheric coal mine. So, the next time we read about the relief felt over the discovery of a new fossil fuel source or promising new extraction technology, spare a thought for the sea butterfly, and keep your fingers crossed that our skin is thicker than their shells.